These critters are 22mm in length and unmistakable shiny black with dull yellow thorax incised with a black cross. They rest during the day and feed at night on an exclusive diet of millipedes. They are very common and found through out SA in a variety of habitats. They have a powerful recurved beak, the tip which is rubbed against a rigged groove under the body to produce sound. They are ambush predators that move slowly towards their prey before rushing out and grabbing with the fore legs, injecting a secretion from the beak that has a quick paralytic action. The prey is sucked dry. Their bite is very painful to humans, but no species in South Africa bites humans or mammals. (Unlike some of Ricardo�s critters in South America which take blood meals from humans and transmit Chagas� disease) A number of species specializes in certain prey types, like our friend here in the photo. In retrospect I saw a lot of centipedes and millipedes coming out after the weekends rain� no wonder that I find this predator then. 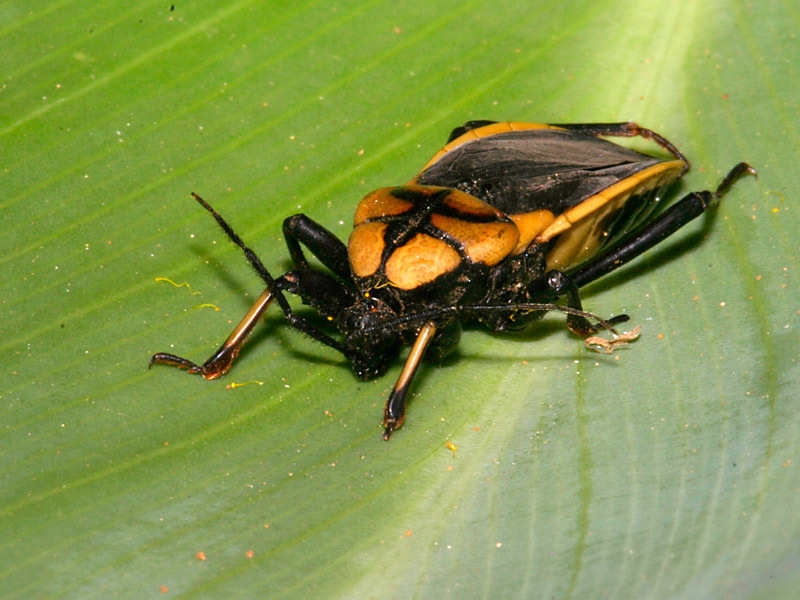 Isn�t it amazing how little we know of our predacious insects? Besides looking rather nice, I think this one has a cool name. First I wish I had F36 for my macros. Second I suppose there was no wind at all to move that leaf. This is a DOF, all the frame is perfect and detailed, the blacks are perfect, more considering that there are quite clear places in the leaf and insect. Congratulations. Great DOF , good details and colours. Very nice macro shot! Good details and colors! He leido tu respuesta a Felipe... pero lo importante es que con tu equipo alcanzas F36!!! Espectucular perspectiva con perfecto foco y agudeza. Una gran captura para este assassin tan especial. I have read your answer to Felipe... but the important thing is that with your equipment you reach F36!!! Espectucular perspective with perfect focus and sharpness. A great capture for this assassin so special. Gerhard, I also read your reply. I'm not sure I understand what the longer exposure in the lowlight after flash did. Whatever it was the results are fantastic! Very well done!! Gerhard, very nice. He looks to have a bit of damage he's lost the tarsus on his front leg. So something tried tried to thwart this assassin. Great shot, and very good note too. Thanks for posting. As I have just said to somebody else with digital its well worth experimenting and reviewing and making adjustments on the fly, this one seems to work really well. goodclean image and great notes. You know, just kidding. I read your reply to Felipe. Really great shot and thanks for the explanation. I have not seen one of these guys before and will be looking out for them from now on. The sharpness is stunning and I also like the long exposures - it just adds a bit of extra quality to the shot. A great name for a bug and its the first time I've seen one. 30 seconds that's a long? Great shot very good details. 30 seconds for insect is eternity, maybe it was dead :-) ? Great macro though, very good DOF and details. Very nice macro, Gerhard. ? not quite as sharp as some of your other postings but very good shot never the less. nice macro!good details and colours, compo is good too.